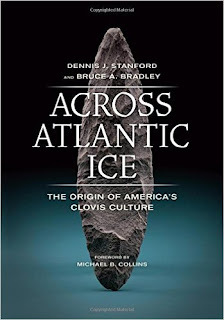 In their book Across Atlantic Ice, the authors posit the theory that people of the Clovis culture came to America along the edge of the ice sheet that went from the northern coast of Spain to the northern Atlantic coast of America. The idea is that they traveled by boat, skinboat supposedly along the ice edge and ate sea mammals that they killed along the way. You can read the book if you are interested in the details. The main reason the authors posited their theory of migration by sea was that the mainstream theory which had people walking to America lacked any evidence to back it up. 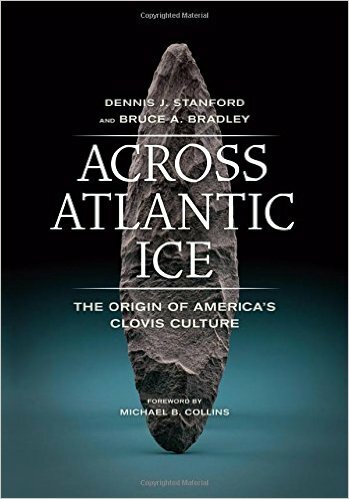 Had the Clovis people walked to America, there should be some trace of their presence in the form of spear points found in Alaska or Siberia, but there wasn't. Instead, the authors claim that the Clovis trail of artifacts leads back to the coast of Spain. Critics of this theory say that there is no evidence of the boats that the Clovis people supposedly used to make their crossing. Of course there wouldn't be after all this time because the organic materials that made up the boats would long have disappeared. But the main thing that interests me about this dispute is the inability of modern people to imagine the ability of earlier humans to build boats. It is also something that the authors accuse their critics of. In any case, there are other migrations that were made thousands of years ago, like the migration to Australia that left no evidence of boats although they could not have been made in any other way given that even at lowest sea levels there was water between their starting point and their destination. Michael Collins, the author of the foreword to the book calls this inability to imagine that ancient people were as imaginative as contemporary humans paleoracism. I don't know that I would call that shortage of imagination racism, but it springs out of the same place that racism does, out of the inability to give others full credit for human abilities.